God doesn’t love me. But He’s given me these teeth to spill your blood and these words to speak over your remains. And when I do that, He’s going to make my dreams come true. Being a vampire is inherently trading humanity for power, but most Kindred don’t do it on purpose. Blood sorcery is about wrapping your arms around blood sacrifice or inhuman philosophy and holding it close against your silent heart. As presented in Vampire: The Requiem, sorcery is a series of rituals passed down from hierophant to acolyte, pastor to parishioner. The blood caked on these rituals is dark and dried, and they are ancient and horrible indeed. That’s what this book is: a gory and grand new exploration of blood sorcery from the powers of the great covenants to the dirty secrets of the street to the figures that lurk in the shadowed history of the Kindred. Written by Benjamin Baugh, David Brookshaw, David A. Hill Jr., Travis Stout and Developed by Russell Bailey. 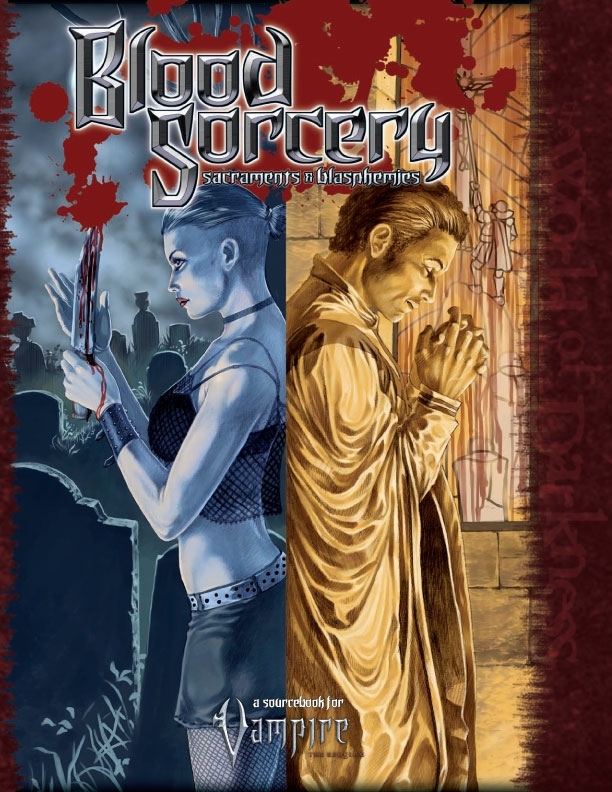 Blood Sorcery is available now in PDF and Print at DriveThruRPG.com! ← Warhammer Fantasy Roleplay 2E Back in Print at RPGNow!